Every employee determines with his or her safe conduct in how far the occupational safety of the company is successful and effective. Only a strong awareness of existing hazards and necessary safety measures ensures safety and a sound health protection during work. which considers and implements all measures regarding occupational health and safety of every day work processes. is indispensable for the successful safety awareness within a shipping company. If the management of a company leads by example, it will convince the employees much easier of the occupational health and safety measures. is essential in establishing safety awareness. Communication includes: talking with each other as well as explaining to those involved why and how particular goals and measures are set. Additional instructions and training matching the operational requirements raise safety awareness. Merely compliance with legal requirements is not enough. Employees who are able to express their opinion and to put in suggestions for improvement without having to fret negative consequences or even punishment will be actively involved in the development of sound safety awareness. The considerate actions of every employee determines the success of a safety awareness. 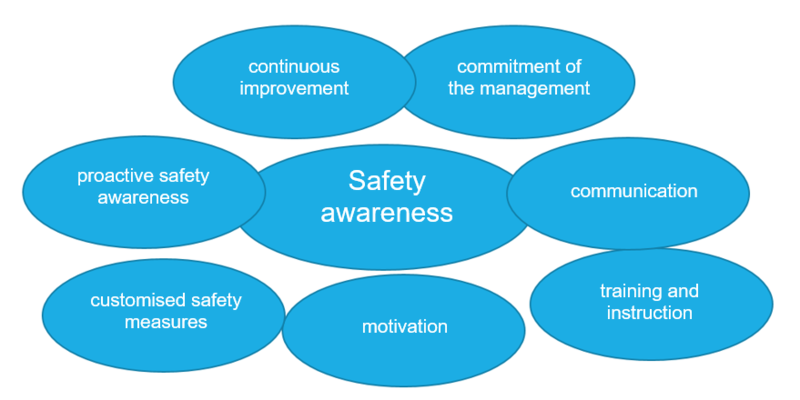 Intentionally accepting the risks ("So far nothing has ever happened…") or ignoring safe procedures in place is a sort of "poison" for a positive development of safety awareness. The deliberate disregard of the company's self-imposed requirements often leads to accidents. All employees should continuously reflect, question and, if necessary, correct their own behaviour and actions. In the course of this, changes of the work environment should always be taken into account. Customised solutions for operational particularities increase the acceptance, will be carried by all and are not experienced as additional burdens. Extensive documentation is seen as extra work and unnecessary bureaucracy by the employees. Employers and shipowners should instruct their employees about possible hazards and the accompanying safety measures on a regular basis. These instructions sharpen safety awareness and ensure that employees actively reflect on hazard potential of their work activities. As German Flag, we want to contribute to better safety awareness on board with our Safety Bulletin. This information based on actual incidents suggests possible existing weak spots of the occupational health and safety measures of specific operational procedures. At the same time, our Safety Bulletin encourages to critically question one's own behaviour and the safety measures in place as well as correct them if necessary.